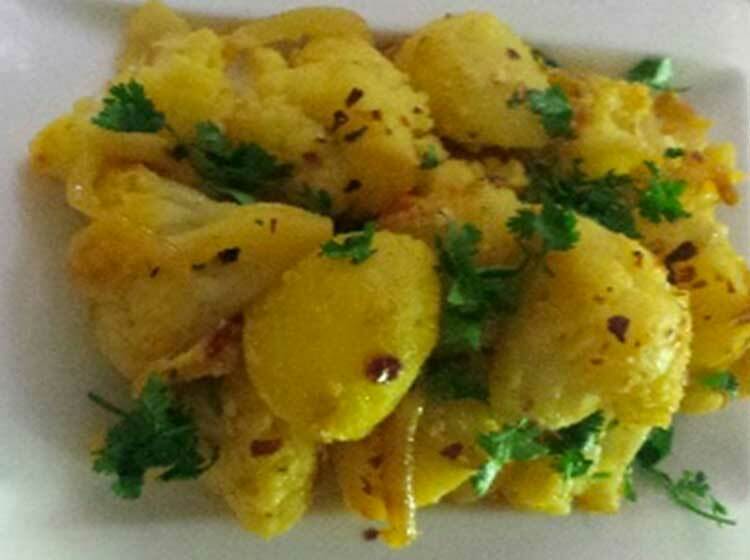 Over the years, Gobi-Aloo (cauliflower with potato) has remained one of the most popular vegetable side dishes. This version is very quick and tasty. Boil the potatoes in their jacket and allow them to cool thoroughly. Boiling in their jacket is important, as the potatoes should be dry, not sticky. Peel and cut them into 2.5cm/1-inch cubes. Divide the cauliflower into approximately the same sized florets as the cubed potatoes. Blanch them for 2 minutes, drain and plunge into cold water to stop cooking further. Heat the oil over a medium heat, when hot, but not smoking, throw in the mustard seeds, followed by the cumin, dried chilli and fenugreek (in that order). Add the onion and green chilli and cook until the onion is golden brown (8-10 minutes), stirring regularly and reducing the heat slightly towards the last 3-4 minutes. Add the ground spices and cook for 1 minute. Add the potatoes, cauliflower and salt. Sprinkle 3 tablespoons water over the vegetables, mix well and cover the pan. Cook until the vegetables are heated through. Stir in the coriander leaves and remove from the heat.